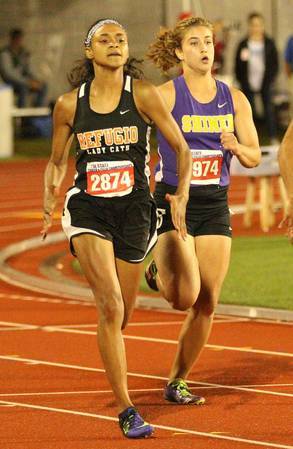 Shiner's Charisma Thomas reaches for the handoff from Kyondra Miller in the Class 2A girls 1600 relay. The Shiner girls tied Italy with 54 points for the Class 2A girls team championship. 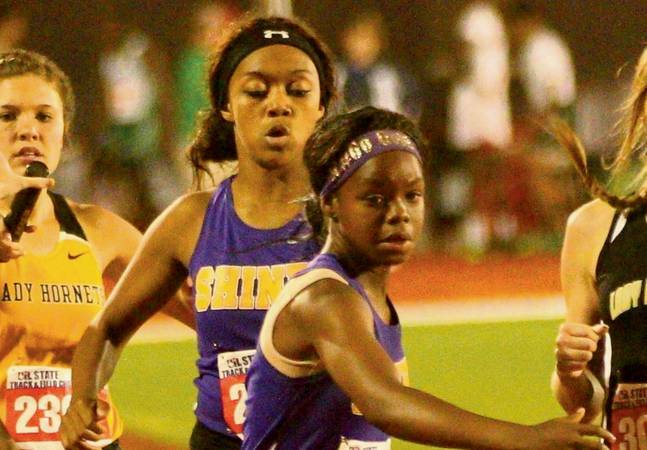 AUSTIN - The Shiner girls stood on the awards podium late Saturday at Mike A. Myers Stadium just as they had hoped. But the Lady Comanches had company. Shiner scored 54 points and shared the Class 2A team title with Italy at the UIL State Track & Field Championships. "I'm proud of the girls," said Shiner coach Cece Oden. "We never gave up. We worked hard all day and yesterday, and it was a team effort. We talked about nipping away with points here and there and we could do it. I said, 'If we can get 50 points, we can win it,' and we ended up with 54." Unfortunately for the Lady Comanches, they could have owned their first state track and field team championship outright if they had scored in the 1,600-meter relay. Shiner was in third place going into the final leg but dropped the baton on the exchange and wound up in eighth place. "We discussed that," Oden said. "They said, 'We're better than sixth, and we're going to go for it.' We were coming in third place solid in that fourth leg and just the excitement and we had to focus on the baton a little more." Shiner got silver medals from Maggie Grosenbacher in the 800-meter run, Sabrina Blaschke in the long jump and the 800-meter relay team finished second. The 400-meter relay team took bronze. "I'm kind of sad our 4-by-4 didn't work out like we wanted it to, but I feel like we really did our best," Grosenbacher said. "I couldn't have run with a better team this year." Oden was also proud of her team, which endured a 5½-hour rain delay and had a number of girls score points. "We have a lot of girls out and they're sharing the weight," Oden said. "Everybody did what I thought. We had talked about the relaxation and the mental part and today we executed." Refugio finished third in the team standings with 34 points. Comanches take silver in relay. The Shiner boys 1,600-meter relay team captured a silver medal, finishing a close second to Canadian. 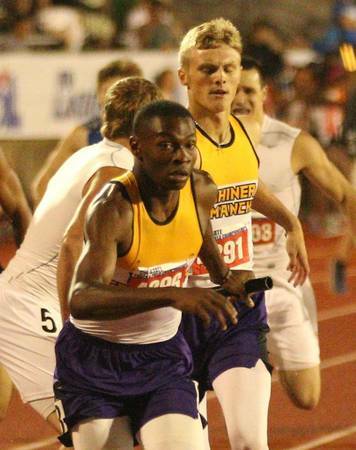 "We ran the best we did all year," said Shiner senior Chad Neubauer. "We put it all out on the line from start to finish. Making it to state and getting second is a great accomplishment." Falls City finished second in the boys team standings with 34 points. Long jump - 2, Kamron Mathis, Cuero, 23-4.25; 4, Josh Moore, Yoakum, 22-10.25. High jump - 1, Khouri Walker, Cuero, 6-8. 400 relay - 5, Cuero, 41.88. 100 - 7, Demarcus Williams, El Campo, 10.93. 800 relay - 6, Cuero, 1:28.87. Triple jump - 4, Dadrian Taylor, Shiner, 44-5. Long jump - 8, Jamel LaFond, Refugio, 20-4.5. 400 relay - 4, Falls City, 43.52; 5, Weimar, 43.96. 110 hurdles - 3, Chase Ramsey, Falls City, 15.22; 4, Brody Gall, Weimar, 15.46. 400 - 3, Joseph Swierc, Falls City, 49.58. 200 - 3, Connor Dziuk, Falls City, 22.50. Long jump - 8, Tracy Moore, Waelder, 19-3. 400 relay - 6, Bay City, 48.14. 100 - 6, Taylor Roberson, Bay City, 12.24. 800 relay - 6, Bay City, 1:43.17. 400 - 7, Acacia Watson, Wharton, 1:00.25. Pole vault - 5, Hannah Lyssy, Falls City, 10-6. Long jump - 1, Alexa Valenzuela, Refugio, 18-4.25; 2, Sabrina Blaschke, Shiner, 18-3.25. Triple jump - 1, Alexa Valenzuela, Refugio, 16.10; 5. Kassidy Bishop, Shiner, 15-11.25. 400 relay - 3, Shiner, 49.88; 7, Refugio, 50.86. 800 - 2, Maggie Grosenbacher, Shiner, 2:19.28. 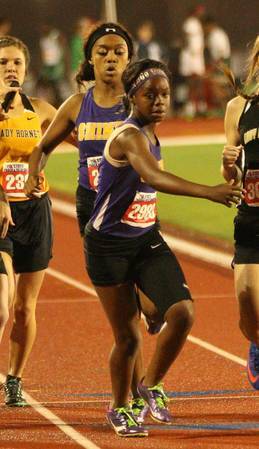 100 - 4, Rashel Bonds, Shiner, 12.72; 9, Mikayla Scott, Woodsboro, 13.25. 800 relay - 2, Shiner, 1:45.69. 400 - 8, Alexa Valenzuela, Refugio, 1:03.24. 300 hurdles - 9, Mackinley Pilat, Shiner, 47.61. 200 - 1, Alexa Valenzuela, Refugio, 25.74; 6, Sabrina Blaschke, Shiner, 26.52. 1600 relay - 8, Shiner, 4:17.95. Refugio's Alexa Valenzuela, left, and Shiner's Sabrina Blaschke run in the Class 2A girls 200 meters. 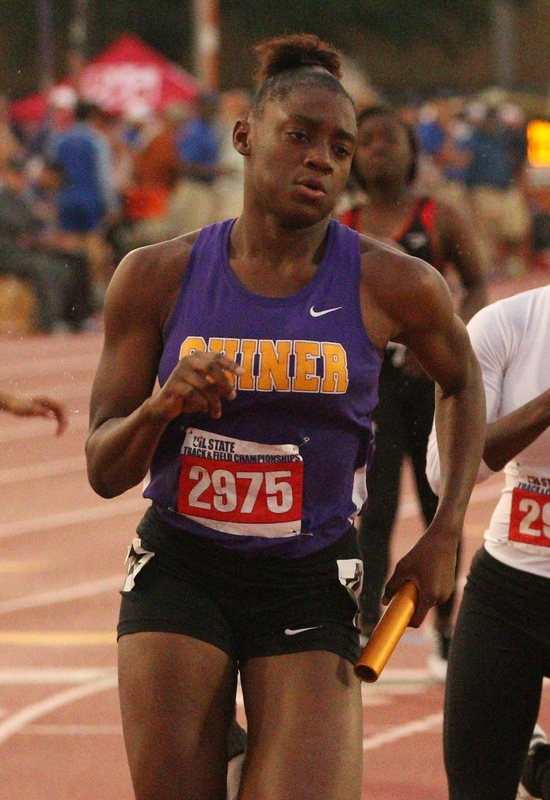 Shiner's Rashel Bonds runs in the Class 2A girls 800 relay. 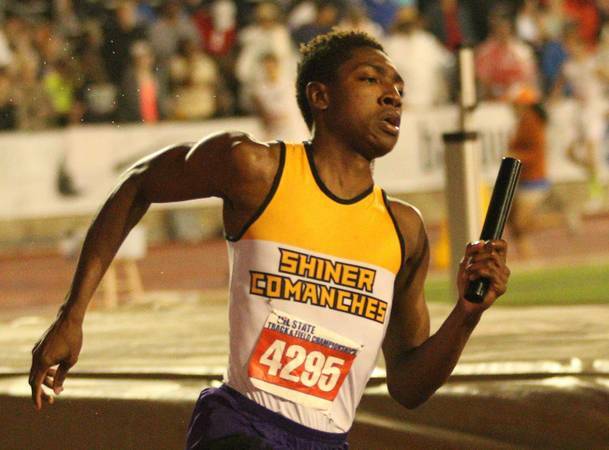 Shiner's Justin Stovall runs ithe first leg of the Class 2A boys 1600 relay. Dadrian Taylor takes the handoff from Ty Boedeker in the Class 2A boys 1600 relay. 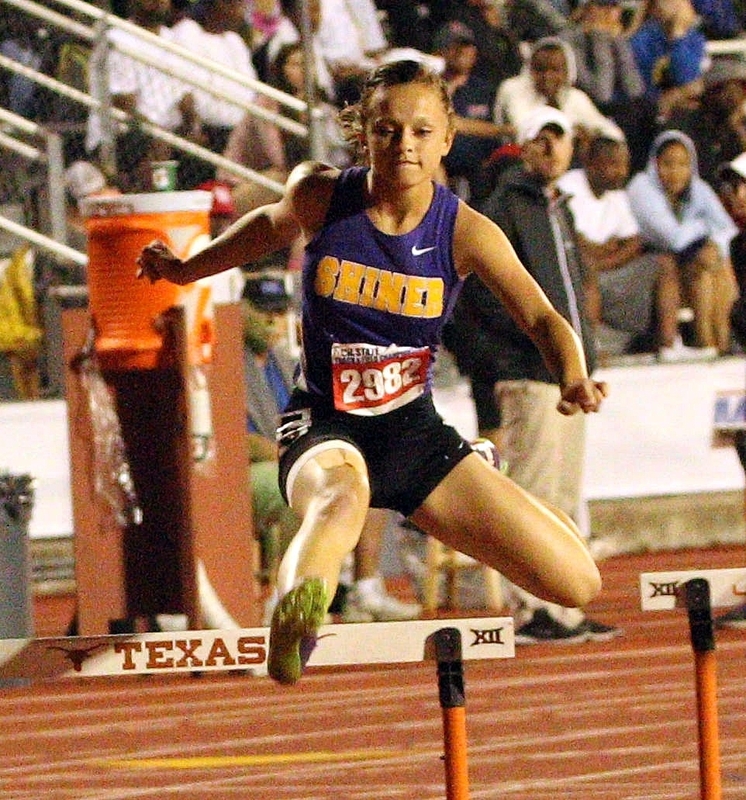 Shiner's Mackinly Pilat runs in the Class 2A girls 300-meter hurdles. Shiner's Charisma Thomas reaches for the handoff from Kyondra Miller in the Class 2A girls 1600 relay.